The NFL is back! Every year the first weekend of August marks the unofficial kickoff of the new pro football season with the Hall of Fame Game. With this game, the six month long separation between football and fans ends and the new season begins. Also during this time, NFL teams are wrapping up their training camps, preparing to move into preseason workouts. 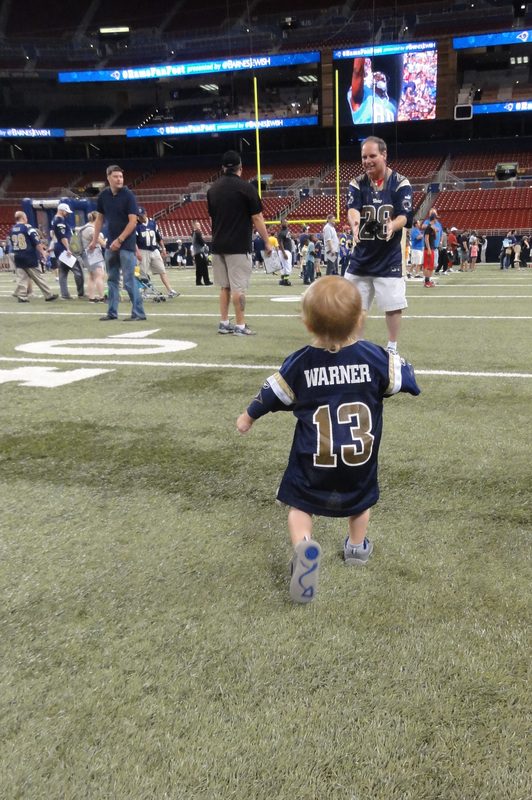 Fans Enjoying Time on The Rams’ Field. 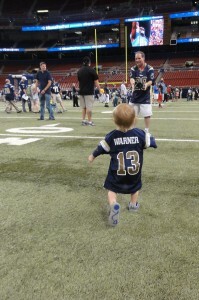 For the second year in a row the St. Louis Rams concluded training camp with “Fan Fest.” This year’s event allowed fans the opportunity to tour the locker rooms, attempt a field goal, test their passing accuracy, or just hang out on the field. 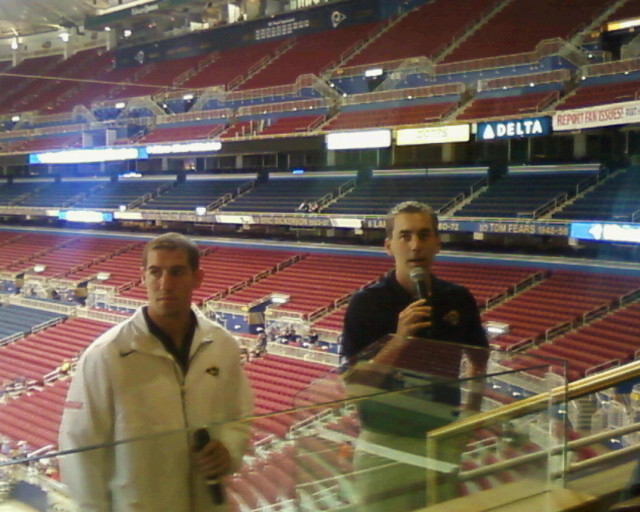 The Rams also allowed a limited number of fans to attend a Q & A session with team executives Kevin Demoff (VP Football Operations and C.O.O), Tony Pastoors (Senior Assistant) and Les Snead (General Manager). Needless to say, you know where I spent my time at this event. I had the opportunity to ask Demoff what the internal expectations are for the 2013 season. “At the end of the day it doesn’t matter what the record is. Whether it’s 8-8, 9-7, 10-6, or even 9-6-1; it’s to win the NFC West and host a playoff game,” Pastoors added. These new Rams include key additions: Jake Long, Jared Cook, Tavon Austin, and Alec Ogletree. This group will have to replace several key players lost including Steven Jackson, Danny Amendola, and Quintin Mikell. The Rams secured a dire need when they signed Jake Long this offseason. Long is a former number 1 draft pick and 4 time Pro-Bowl player and should provide some stability to an offensive line that has had over a dozen different starters in the past two seasons. The Rams made protecting Sam Bradford a top priority this offseason, Les Snead commented, “We kept Jake in town for 4 straight days; we were not going to let him leave without a contract.” He then joked, “With a big guy like that, after four days the worry is he is going to run out of clean underwear. We were afraid we would lose him because of dirty underwear.” They didn’t lose him; instead he signed a 4-year, 36 million-dollar contract. Jared Cook was the top tight end free agent available and should add both speed and size to the Rams’ passing attack. Cook has 4.49 speed in the 40-yard dash and can line up both in and outside the box. He is also the largest Rams receiver and should be a weapon down by the goal line. When I asked Les Snead what he thought about Cook, he commented, “Sometimes the defensive coordinator just gets it right; they call the right defense and no one is open for Sam. I like to use the analogy ‘throw it up and let the big guys pull down that rebound.’ It’s nice to have a big guy with long arms to go up for that ball.” I look for Cook to fill the void left by Danny Amendola as Sam Bradford’s safety blanket underneath. In a word, explosive. Tavon Austin was the 1st round selection of the Rams in this year’s draft. They traded up to the 8th spot to select him. Sometimes I feel foolish getting so excited about a guy who has never played a down in the NFL, then I go back and watch some game film from his senior season at West Virginia and become giddy all over again. Austin has 4.3 – 40 speed, a skilled punt and kickoff returner, and an accomplished wide receiver. In both his junior and senior collegiate season, he had over 100 catches and over 1100 yards and was an All-American each season. The national writers are comparing him to DeSean Jackson of the Eagles. Opposing cornerbacks will have their hands full (or at least be very winded) having to chase Austin and fellow wide receiver speedster Chris Givens 50 yards down the field. Even if the two are not hauling in the catches, it should open up the middle of the field for the aforementioned Cook or Austin’s former West Virginia teammate Stedman Bailey, whom the Rams selected in the third round of the 2013 draft. I would be remiss if I only focused on the offensive side of the ball; the defense got a brand new toy as well. Alec Ogletree was the second selection the Rams had in the first round of this year’s draft (30th overall). Ogletree should jump right into a starting role in the Rams 4-3 defense, probably suiting up as weak-side linebacker. Ogletree had 111 tackles his senior season as a Georgia Bulldog. Group that with the 142 tackles last season by middle linebacker James Laurinaitis and the 114 tackles by strong-side backer Jo-Lonn Dunbar, and you have a very potent linebacker corps. Ogletree has good speed for the position as well, posting a 4.70 second 40-yard dash and should be able to pick up coverage of pass catching running backs coming out of the backfield. Replacing Pro-Bowl running back Steven Jackson is no easy task. SJ39 holds the Rams’ franchise record for most rushing yards (10,135) and has been the face of the Rams’ backfield for the last 9 seasons. During that time he carried the ball over 230 times and rushed for over 1,000 yards every season except his rookie year. He has a career yards-per-career average of 4.2 and scored 64 touchdowns during his time in St. Louis (56 rush, 8 receiving). Age may be slowing the 30-year-old running back down a bit, but he did still account for over 1350 total yards of offense in 2012, which will have to be replaced by the platoon of running backs Daryl Richardson, Isaiah Pead, and Zac Stacy. GM Les Snead is not worried about his running back by committee approach stating, “The position I feel most comfortable at is running back.” He went on to explain that the combination of Richardson, Pead, and Stacy provides a different look for defenses to prepare for. Instead of just preparing for a power “north-south” back, defensive coordinators now have to be set to stop both power runners and guys who can get outside the tackle box. Danny Amendola at times was brilliant, and at times injured. When he was healthy he could catch just about anything on the field. In 2010 he had 85 receptions, and in 2012 he had 63 in only 11 games (he missed all but one game in 2011 with injury). During those two seasons he averaged over 5 catches and 50 yards a game, which may not be hard to replace statistically, however what will be difficult to replace is the intangible value he had as QB Sam Bradford’s safety blanket. Bradford and Amendola had chemistry; the question now is who can step up and fill the role as the guy Bradford can check down to or change to a hot route Bradford can hit while back-peddling two steps. One reason Jared Cook was brought in was to fill this role, but some early indications out of training camp are that Brian Quick may fill in nicely. Quick was drafted in 2012 and had a slow rookie season–not uncommon for players drafted from smaller colleges. After a year of learning it looks like Quick is poised to take a more prominent role in the offense and could be a good middle-of-the-field receiver. The biggest weakness for the Rams going into the 2013 season has to be at safety. In a salary cap move, the Rams released their best safety from last year, Quintin Mikell. Mikell was scheduled to make $9 million this season and the Rams needed to free up some cap space, which meant cutting ties with the veteran safety. The problem, there is really not a lot of depth at the position. The move leaves the Rams with Darian Stewart and Rodney McLeod to field the position, with T.J. McDonald, the Rams third-round choice in this year’s draft, also likely to see some playing time. 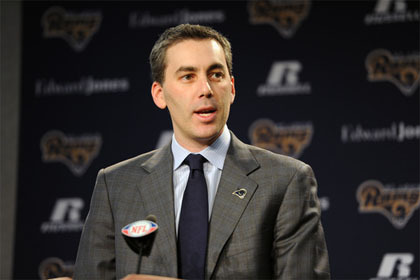 He refused to comment on if that future would be in St. Louis or not, however, when asked if Missouri Governor Jay Nixon and Rams’ owner Stan Kroenke have had any face to face meeting regarding the Rams staying in St. Louis. Demoff stated, “Neither side is willing to disclose the process. If a deal is going to get done it is going to get done behind closed doors. “ He added, “One thing we learned during the arbitration process was what things we can do to make a better experience for fans.” My own answer to that: win! Yes, the stadium needs a lot of upgrades (please, a new sound system) but the best thing you can do to improve the fan experience is win. 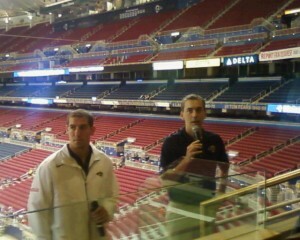 Rams single game tickets are now on sale and can be purchased at stlouisrams.com.